Don’t be shy, try Eye-Fi ! What a corny post title. But what a not-so-corny new toy I have here ! I got myself an Eye-Fi SD card. 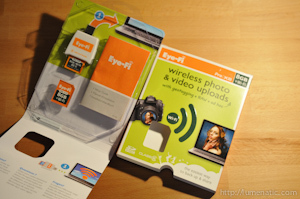 Eye-Fi cards have a built-in WLAN antenna, meaning they can stream the photos you took wirelessly to your computer. Or iPhone or iPad, if you are on the road. The company offers several models, each one having a different size and feature list. 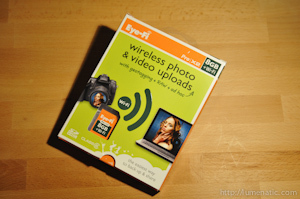 I got the Eye-Fi Pro X2 8GB model, which offers everything I want to have for wireless photo fun. The Pro X2 can stream RAW files (not all Eye-Fi cards can do that), geotag pictures (using wireless LAN localisation, no GPS) and connect with public hotspots. When you have separated the cover from the content, the lid of the inner box piece folds open and reveals the actual card. And now you see why they put a fake card on display. 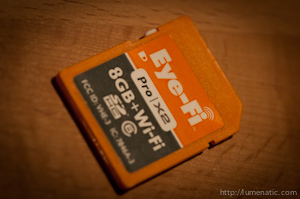 The Eye-fi card comes with a USB card reader, and the card is already plugged into, therefore you only see the bottom half of the real card. There is no CD with the package – the software is already on the memory card. Just plug the card reader into your computer and install the software (both Mac and PC versions are supplied). 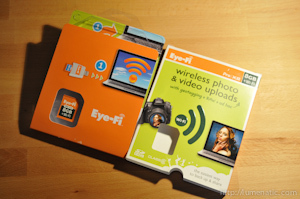 The “Eye-Fi Center”, as the software is called, allows you to configure the card the way you want to have it. You can set different settings for streaming JPGs, RAWs and Video files. Either you can stream it to your computer using your router in the house, or you can directly upload the stuff you photographed to the internet. Some of the most common photo services are pre-installed (Facebook, flickr, mobileMe, Picasa). Since I so some sorting and post-processing with my pictures, I do not want my photos to reach the web directly. Therefore I chose to stream the picture to a specified folder on my harddrive instead. At first you have to connect the Eye-Fi card to your local network. This should be easy, but since I am haunted by the ghost of faulty technology it did not work at first. I saw the network in the list, entered the password and tried to connect… nada. Some frustrated retries later it worked finally. What I changed – nothing. Hm, probably sun activity in conjunction with a lunar ecplise and me not washing hands long enough after riding the bicycle to work and back on a Monday which has an even number on the calendar… or something like that. Finally the card was connected to the router / Mac and when I shot an image it the picture was uploaded automatically (as long as the camera is switched on). But upload speed was not satisfying at first. I placed the camera next to my computer with the door to the hallway open, and the card uploaded very slowly. In an Einsteinian moment of brightness I figured out that connectivity must be somehow playing into the situation. So I did a little test, not scientifically accurate but practical. 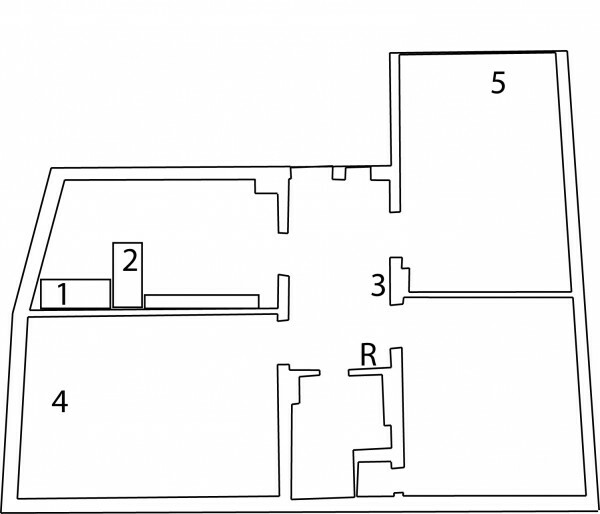 To document the test I sketched the layout of our apartment, so welcome to a tour of my home ! 1 and 2 show the position of the two desks I am using. I am sitting usually in front of 1 , where the computer is located. The router is in the hallway (R). Then I took several pictures and placed the cameras on the locations I have marked on the map. I started with 1 and 2. From 2 I had a brittle but working connection, from 1 I nearly had no connection. The distance is not really big but the signal would have to pass a bookshelf and a wall to reach the router. Then I relocated the router. Usually it stands beneath a small shelf where my printer and the telephone are also standing, and I lifted the router to the top of the shelf. That did the trick. The signal was good (still better from 2 than 1) and the pictures uploaded quite quickly. I tried other locations (3, 4, 5) and from here the connection was also very good. A word on battery power…. The wifi antenna needs power of course. And of course Eye-Fi state on their website that thanks to “advanced power management” on the card the battery life will not be impacted severly. But I know one thing: You can’t trick the laws of physics and the battery life will be shortened. If it is really an issue will be shown when the card is in use for a while. I personally will use the Eye-Fi card for indoor shoots only at first. There it will be very convenient to do a test shot and immediately check the result at the Mac without fumbling around with cardreaders and cables. For outdoor shoots I will still take the “normal” Sandisk card I suppose. No need to let the Eye-Fi search for a hotspot when I am in the woods.